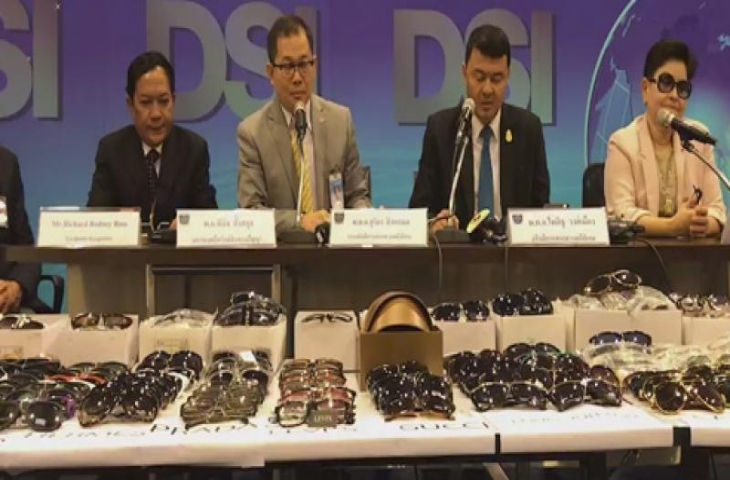 210.000 fake pair of Eyeglasses was found bye the Bangkok police by the Department of Special Investigation. The Head of the DSI team in cooperation with the intellectual property department told the media that on tuesday three warehouses in klong thom and klong san areas of capital led to the arrest of the chinese owner link chur chu. Fake sunglas​ses woth 40 million bath from different brand like Gucci, Louis Vuitton, Dior, Prada, Chanel, Hermes, Burberry, Lacoste and Levi glasses were seized. Thai police was revealed that the search warrants were issued following surveillance on the warehouses after authorities recieved a tip-off that counterfeit goods were being stored and sold from the buildings. 210.000 fake pair of Sunnglasses was found bye the Bangkok police by the Department of Special Investigation.